DNA Analysis of Paracas Elongated Skull Released – With Incredible Results – A MUST READ!!!!!!! I just blogged another article on this, but this one is even better. Thanks Laurent for some fabulous information! Lots of love!-A.M.
Paracas is a desert peninsula located within the Pisco Province in the Ica Region, on the south coast of Peru. It is here were Peruvian archaeologist, Julio Tello, made an amazing discovery in 1928, a massive and elaborate graveyard containing tombs filled with the remains of individuals with the largest elongated skulls found anywhere in the world. 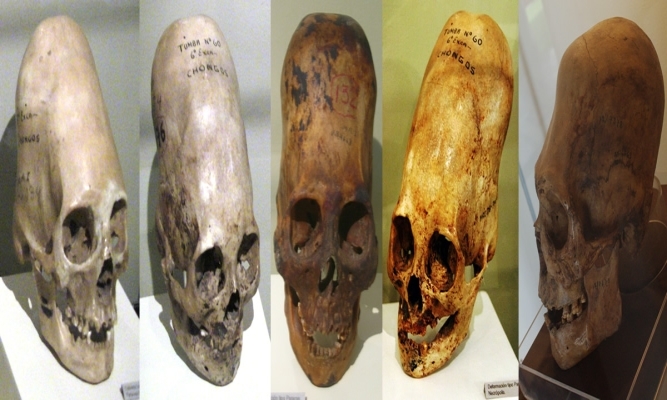 These have come to be known as the ‘Paracas skulls’. In total, Tello found more than 300 of these elongated skulls, which are believed to date back around 3,000 years. A DNA analysis has now been conducted on one of the skulls and expert Brien Foerster has released preliminary information regarding these enigmatic skulls. It is well-known that most cases of skull elongation are the result of cranial deformation, head flattening, or head binding, in which the skull is intentionally deformed by applying force over a long period of time. It is usually achieved by binding the head between two pieces of wood, or binding in cloth. However, while cranial deformation changes the shape of the skull, it does not alter its volume, weight, or other features that are characteristic of a regular human skull. The Paracas skulls, however, are different. The cranial volume is up to 25 percent larger and 60 percent heavier than conventional human skulls, meaning they could not have been intentionally deformed through head binding/flattening.